G2’s principals were fortunate enough to have dinner with Benoit Mandelbrot early in 2010 at his base at Yale University. When asked how to summarize his 40 years of research on the markets he responded: “Everything that matters is in the tails”. While his work on (ab)normal distributions focuses on market index prices, the same principles can be extrapolated to individual stocks. The chart below from Blackstar shows the lifetime compounded annual return of a broad cross-section of US stocks from 1983 to 2007 (liquidity filter applied). The “buy/sell/forget” buckets are not equally sized. The vast majority of all stocks fall into the last category – they are fairly priced and not worth the bother. As such, stock selection is really a process of rejection. A good system must reject 95-98% of the universe and focus on the tails of the distribution – where the biggest opportunities reside. The next chart illustrates just how important this concept is. 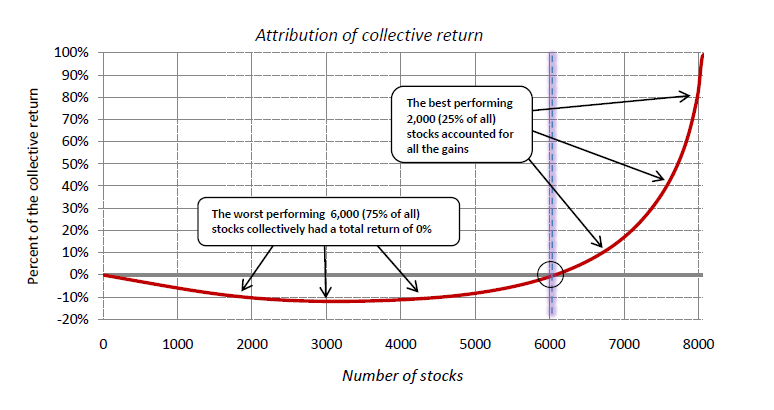 The breakdown in return attribution shows how a small proportion of stocks do most of the heavy lifting. The bottom line is that 25% of the most profitable stocks account for all the gains. These relatively rare opportunities are what investors should focus on. In other words, a minority of stocks are responsible for the majority of the market’s gains. Given the importance of the outliers, systems which select hundreds of stocks long and short make little sense to G2. There are not that many stocks worth owning/shorting. Not surprisingly these more diversified systems tend to hug the index, albeit with high fees. G2’s approach is to avoid the middle and deliberately seek the tails. Hence our portfolios are quite concentrated, with most of the book comprising 40-80 positions on the long side and a similar number on short side. 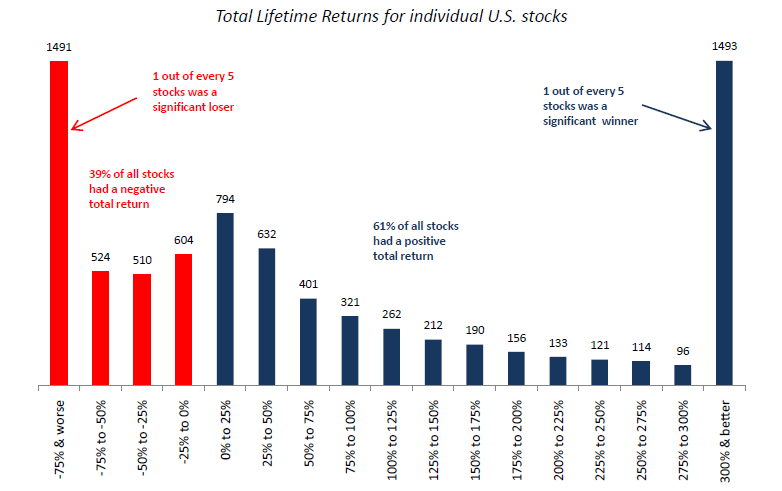 Identifying the few outlying stocks that matter requires rich datasets and hundreds of factors that can discriminate between potential winners and losers at a very granular level. Current development work is focused on adding: insider transactions, short interest, securities lending and equity options data (early tests indicate they all bring some predictive value to stock selection). Until then, G2 will continue chasing tails.